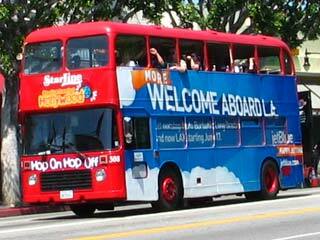 Guided Bus Tours of Los Angeles and Hollywood - There are a number of guided tour bus companies. In the morning you can see tour buses lined up on Hollywood Boulevard, ready to depart for the day. Some of them operate directly out of the van, while others actually have a retail storefront. Two of the most established tour companies on Hollywood Boulevard are StarLine Tours and LA City Tours. Both companies are featured here, and you can make online reservations for each of these tour operators. Browse attractions on Hollywood Boulevard while you wait! Guided Tour Tips - Tips for guided tours of Los Angeles and Hollywood. What to bring, open-top vans, kids on a tour, photography tips and more. Guided Bus Tours from Anaheim, Buena Park and Garden Grove - Southern California Gray Line offers guided tours and transportation from most hotels near Disneyland and Knott's Berry Farm. Movie Stars Homes and 1/2 Day Shopping Tour includes Rodeo Drive, Hollywood Boulevard, Santee Alley in downtown Los Angeles and shopping at the Citadel factory outlet stores. Universal Studios shuttle, with or without admission. Have lunch with the whales at SeaWorld! More Guided Tours in Los Angeles and Hollywood - A large list of most guided tours on or near Hollywood Boulevard, plus many others throughout Los Angeles. The lists include website links, telephone numbers and pictures of many of the tour vans. Scenic Guided Segway Tours of Los Angeles - Get an up-close view of the sights! You'll see things from the sidewalk that you can't see from a passenger van on the road - without all the walking! 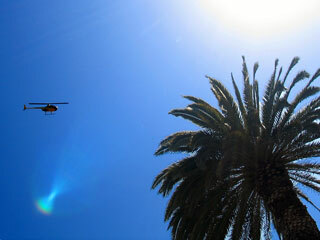 Scenic Helicopter Tours of Hollywood and Los Angeles - This is the only way to "see it all" in one day. You'll bypass all the traffic and stop signs as you zoom from one tourist hotspot to the next. Enjoy spectacular, panoramic views of the L.A. basin that you are just not going to see from a bus. Observe the Hollywood Sign from feet away instead of miles. Imagine being so close that you can zoom in on the letter "H" as you focus your camera lens on the landmark! Movie star home tours offer an entirely new perspective when you can see their backyard! Shoot some video while gliding along the California coast between Marina del Rey, Venice Beach, Santa Monica and Malibu. Take in the glamour of the Sunset Strip but leave the traffic jam behind! See the tall buildings downtown on an eye-to-eye level! Don't forget to take a camera, because you'll be talking about your helicopter tour long after you go home! Bypass the traffic on the Sunset Strip! Get up close and personal with the Hollywood Sign! Movie Stars Home Tours from the air!